PhD (Candidate of Sciences) in Law, Associate Professor of the Department of Theory and History of State and Law. She was born on July 17, 1974. She graduated from the Law Faculty of the BSU in 1996. Since 2000 she has been working at the Law faculty of BSU. 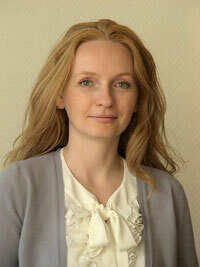 In 2010 she was awarded PhD in Law for the thesis “Institute of Licensing as element of the system of permissions”. She lectures on General Theory of Law, History of Political and Legal Doctrines, History of State and Law of Belarus. She has authored more than 30 research papers and training manuals. In the article such questions as the notion of the stage of licensed production and the content of stages of licensed production are studied. It is the author's opinion that the stage of the licensed production is its relatively independent part and represents the cumulative procedural actions performed by the participants of the licensed production in a certain sequence directed towards the receipt of an intermediate procedural result, necessary for the achievement of the final goal economically determined – the permission of the license application, prolongation of its term or the introduction in it of the changes and (or) additions. The author marks down 5 stages in the structure of the licensed production: commencement of the licensed proceedings; inspection of the license applicant conformance to the license requirements and conditions; decision making on the business; appeal of the refusal of the licensing body to issue the license; execution and issue of the license. The article is devoted to investigation of substantive and procedural aspects of state control and supervision in the licensing field. The author investigated main approaches to definition of terms “control” and “supervision” in the administrative law at the present time; definition of licensing supervision was given; its essential characteristics were defined; principles of licensing supervision were stated; goal and objectives of licensing supervision, powers of licensing bodies as licensing supervision entities were determined; license requirements and conditions were classified; basic forms of licensing supervision were characterized.